Random Panel: Who could have guessed? 3 Responses to Random Panel: Who could have guessed? Is that villain the same guy who’s not immune to weapons and bullets? 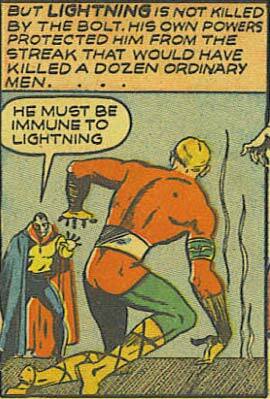 Regardless, if I were fighting a guy named Lightning I’d bring a rubber truncheon. Yes, they’re all from the same issue, it’s MasterMind (whose only weakness is bullets and other weapons) vs. Lightning. Not much of a Master or a Mind if he can’t figure out that maybe a guy named Lightning who, you know, THROWS LIGHTNING might in turn be immune to it. Well, if the dude can’t figure out a better way to protect himself from “bullets and other weapons” than Colonel Sanders’ radioactive chicken coating, then maybe he wouldn’t be able to put that together.